After watching the entire game, it’s safe to say that it’s probably easier to copy and paste the observations from Ghana’s game against Uganda and use it from Day 8’s observations. Ghana’s first half was once again incredible, another attacking display that many would expect from the team given the strength and talent at their disposal. In the opening stages of the game, Mali were happy to concede the bulk of possession to Ghana in an attempt to hit them on the counter attack. 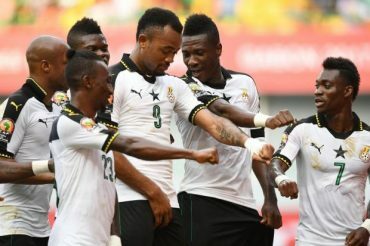 The Black Stars used this to their advantage, as Jordan Ayew and Christian Atsu continually launched crosses into the box, only for Dede Ayew to squander two of the best chances of the game. The younger Ayew brother finally managed to grab an assist after playing an early cross into the box which was met by Captain Asamoah Gyan, who headed the ball passed Sissoko to make him Ghana’s all-time top scorer at The African Cup of Nations. The rest of the first half saw Ghana’s shots saved by the goalkeeper or routinely blocked, preventing the scoreline from increasing. The second half was a complete opposite to what we saw in the first. Similar to the game against Uganda, Mali began to gain control of the game from Ghana and became the dominant team. Chance after chance was created, yet the same chances were squandered. Marega was a culprit in the first 25 minutes of the second half, failing to score two great chances at close range. Substitutes Kalifa Coulibaly and Bissouma continued to terrorise Ghana’s defence to no avail. Depsite progressing to the next round, The Black Stars will want to ensure that their heads don’t drop against Egypt, otherwise they could finish in 2nd place in the group. Concentration is one of the most important mental attributes that a goalkeeper possesses and it does have the potential to dwindle as the game progresses and not a single attempt on goal has been made. Aside from the brilliance of John Boye in front of him, Razak Brimah single-handedly won Ghana the three points in the game. The first save he had to make was to deny Marega’s header from a Sako cross from hitting the back of the net. Most of Mali’s shots after that went wide of the mark or were defended valiantly by Ghana’s back-line, but it was the closing 5 minutes that required Brimah’s alertness to be at its maximum. Mali substitute Kalifa Coulibaly, who spent the tail-end of the second half being a thorn in the side of Ghanaian defenders, lashed a powerful effort towards the near post a close range, only for Brimah to pull off a fantastic stop. Sako’s freekick in extra time also required excellent reflexes to prevent a draw. Alain Giresse brought on Yves Bissouma in the first game against Egypt and he changed the game. The manager made a similar move today against Ghana and the 20-year-old once again made a massive impact in the second half. It’s no wonder that his introduction in the game culminated in Mali’s performance improving, as his skills in passing and dribbling played part in the team’s revival. One particular run he made was down the right hand side, knocking it past two players before squaring the ball into the box, though his delivery was not met by an oncoming Mali player. Doumbia was also excellent when he came on, another player who provided a direct style of attack to the team. He was constantly a threat when he came on and managed to win a free kick in extra time when he was brought down by Acheampong. Mali need to win the final game in order of standing a chance of progressing to the knockout stages (which also means that Ghana will have to beat Egypt), therefore players like Bissouma and Doumbia should get a nod over some of the other starters in the team who have failed to impress over the last two games. It was always going to be tough: Uganda entered this tournament with one of the weakest squads, after being drawn in one of the toughest groups, alongside one of the favourites and two other accomplished teams. Despite the impossible odds, over the course of the two games they never stopped trying. They ran and ran until all the energy had drained out of them. And in the end, it just wasn’t quite enough. But that’s not the point. It’s a cliche, and perhaps it’s patronising, but Uganda’s battle was in getting to this tournament for the first time in 39 years. We should praise them for what they have achieved. Uganda is a nation of enormous poverty and many social issues – the players have not just overcome their qualifying opponents to make it to Gabon but this also. And once they were here, they were absolutely determined to make their country proud and never wavered from the cause. They showed tremendous team spirit and work ethic today, defended magnificently for 88 minutes against superior opposition, and can hold their heads up high despite being the first team eliminated. They have by no means disgraced themselves against two of Africa’s best teams and can take great pride in their performances. For the Pharaohs, it was the classic big boy lucky win against plucky minnows. For the vast majority of the game, they never looked like scoring. Uganda goalkeeper Denis Onyango had very little to deal with other than the occasional shot straight at him. Much of this was down to exceptional Ugandan defending, but it was also because Egypt just lacked any kind of incisiveness. It’s obvious from watching this team that Mohamed Salah is the most talented player. In the end, it was he who provided the killer blow by setting up substitute El-Said, but not before he had totally miscontrolled the ball on the bumpy surface, denying him the opportunity to score the winning goal himself – ironic that it was his mistake which led to his team’s goal, as he had a defender in front of him who may have covered any shot he might have attempted. Egypt were good enough at the back to snuff out any Uganda attack, as they had been against Mali. But neither of these have proven to be stellar attacks – the only two teams in the tournament yet to score – so just how good they are defensively remains to be seen. Hector Cuper seems to have his team relatively well-drilled – he just needs to find an attacking combination that works, and the Ghana game gives him a perfect opportunity to do this. Going into the final games, it looks as if 4 points may be enough for Egypt to progress even if they lose to the already-qualified Ghana. Even if the Black Stars don’t take their foot off the gas and beat them, it’s hard to see Mali breaking down this resolute Uganda team, given that like Uganda and Egypt, they don’t have an effective lead striker. Moving forward, can Egypt be considered contenders now? While their attack has been poor, their defence has been pretty solid and is experienced. This may leave them quite well set-up for knockout football, like the Egyptian teams of old. But those Egypt teams also had star quality, the ability to prise open a defence, and a striker who has both good movement and clinical finishing. With Salah disappointing so far and Marwan Mohsen up front being a total waste of a starting spot and making one long for the days of Zaki, Mido and Gedo, it looks as if Egypt are one or two players short of being real contenders, although they are good enough defensively that you can’t rule them out just yet.